Last week, we discussed how to create a digital signature that you can use to sign official PDF documents in your own handwriting. But what if you don’t have a digital ID yet and you need one? Stay right here, and I’ll walk you through the steps you need to take in Adobe Acrobat. 1. Open a document you wish to sign and choose Advanced -> Sign & Certify -> Place Signature. 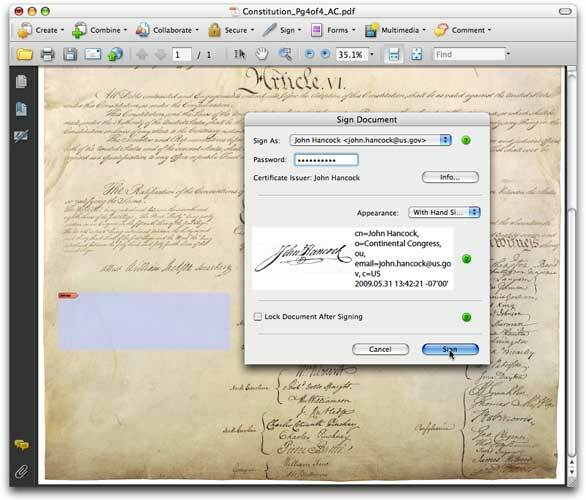 Acrobat will prompt you to click and drag a rectangle defining the placement and dimensions of your digital signature. Do that at the appropriate place in the document. Immediately the Sign Document dialog will appear. 2. If you don’t already have a digital ID, choose New ID and, in the Add Digital ID dialog, select A new digital ID I want to create now. Click Next and populate the digital ID fields with your information. Note that only the Name, Email Address, Country/Region, Key Algorithm, and Use Digital ID For fields are required; the rest are optional. 3. Clicking Next will prompt you to save the digital ID file to a safe, permanent location on your computer and supply a password. Remember your password. You are required to enter it every time you sign a PDF to prove you are the owner of the digital ID. 4. Click Finish to save the digital ID and return to the Sign Document dialog, where you can now select your ID from the Sign As dropdown menu. 5. Beneath the Sign As field, enter the password of the selected digital ID. You may notice that, by default, the digital signature preview depicts a plain text signature with the distinctive Acrobat A logo behind it. This is the Standard Text appearance. Change it to your desired appearance—the one with your handwritten signature—by choosing “With Hand Signature” from the Appearance dropdown menu. The preview should update to match, showing exactly the signature appearance you created. Signing the document with the correct digital ID and signature appearance. 6. Click the Sign button to digitally sign the document, which also requires that you save it. Ta da! You now have a document that is officially and digitally signed with your handwriting. It is your signature in digital format, and legal in every way. Pariah S. Burke is the author of Mastering InDesign CS3 for Print Design and Production (Sybex, 2007), and other books; a freelance graphic designer; and the publisher of the Web sites GurusUnleashed.com, WorkflowFreelance.com, and CreativesAre.com.